Even though the Prolink PixelView GeForce4 MX440-8X is a DirectX 7 part it's still pretty damn fast, at least that's what the benchmarks seem to point towards. Still, if you're contemplating purchasing a new videocard, I would have to suggest that you stay away from older generation cards which are not at least DirectX 8 compliant. There are just too many games coming out that take advantage of vertex and pixel shaders which is something all GeForce4 MX's don't have. With a street price of just under $200 CDN ($145 US) the Prolink PixelView GeForce4 MX440-8X is moderately priced, but it does come with a ton of features; including DVI, VIVO capabilities and a decent software bundle. Factory overclocked at 300MHz/550MHz means the Prolink GeForce4 MX440-8X will probably be the fastest stock MX440-8X out there, and it was good to see that there was still a lot of head room - with the card maxing out at 387MHz/613MHz. Not bad indeed! 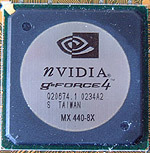 Overall, the Prolink PixelView GeForce4 MX440-8X is a good videocard. If we reviewed it maybe six months ago it would have won an award. Unfortunately though, if you're going to be purchasing a new videocard now, you really should get something that is DirectX 8 compliant so you have a videocard that's a bit more future proof. That is, if you can afford the extra investment. Here are a few other articles that you might enjoy as well... Discuss this in the PCstats.com Forums right now!